D A Prince reviews a debut collection by Julie Hogg in which the poems have potential for performance as well as being successful on the page. Familiar places can provide a focus for a debut collection, offering a unity which can be explored in many ways as well as being an anchor for the poet. The brief biographical details for Julie Hogg on the back cover of Majuba Road place her firmly in the North East; she has always lived in Redcar, and the varied landscapes of East Cleveland serve as backdrop to these poems, along with the people who live there. Vane Women Press is the imprint of Vane Women, a long-established group who describe themselves as ‘a writing, performing and publishing collective’ who promote women writers living in the North East; as expected, this collection is not only peopled with women but also celebrates their strength and resilience. While Google Earth can show us what the locality looks like, only a writer can explore the people who bring it alive. seem straightforward enough – until we look at the choice of ‘so’. Surely when a destination is reached that’s enough? But not here. There’s the physical destination: yes, there’s that loop of road between sea and land, and visible to anyone who looks online, looking as scuffed and weathered as such roads do and with a typically beat-up carpark. The slightly mechanical phrasing of ‘reached my destination’ has a faint echo of Sat Nav-speak, at that moment when the device has done its work and has nothing further to offer. It feels as though it ought to be an ending but here it’s a reason – ‘so’ – for going further, beyond this physical place into Hogg’s more abstract considerations of this society, the Majuba Road environs, scrunched up against the North sea. The word ‘muliebrity’ pulled me up: Hogg is not a poet given to Latinate and (to me) unfamiliar vocabulary. Yet it’s the fact of this word’s unfamiliarity that is significant: it is defined as ‘womanly qualities’ – in other words, the female equivalent of ‘virility’, a word that is part of everyday vocabulary. Muliebrity encapsulates much that has been shown, variously, in previous poems, and underlines how much women’s survival skills and strengths pass unnoticed. For once, it is the final poem that offers the reader the most illuminating place to start. This is a city of semi-boredom and no way out. In the following poem, ‘Dirty Carpet’, the sticky pub carpet with its “pungent pattern” becomes a symbol for what happens in the bar. It was a dirty carpet. 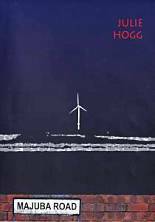 Colloquial usage (‘fags and booze’) and easy internal rhyming (‘bar/are’), plus the pairing of poems across an opening are features that Hogg employs throughout this collection and her use of paired poems works particularly well. In ‘Skinningrove 1974’ and ‘Skinningrove 2014’ she gives the poetic equivalent of two photographs forty years apart – the same opening three lines, but then small shifts of detail indicate how a couple and the landscape have changed. The earlier “… obligatory/ primrose picking in the/ valley conversation” becomes, in 2014, “…obligatory/ seventies social housing/ policy conversation”; the “orange water/ in the beck” stained by effluent from a factory becomes, by 2014, “clear water”. Some things get better. Hogg frequently uses short lines – between two and four words – and I wonder how much this is a result of poems written primarily for the voice, for performance, rather than for the page. This would account for some line endings that appear uncomfortable until the poem is read aloud. The spoken voice also can overcome ambiguity: in ‘Naval Overcoat’, where the ‘Dead weight’ of the coat is heard in that single opening line, the ending is ambivalent in a way that might be resolved in performance. But better an ambitious collection than one which confines itself to safe description and tidy endings. The lightness of ‘soul skating’ – the facing poem – comes from the spread of lines across the full page, like the gliding figure of the skater, and this is surely a poem to be seen in print. The balancing of poems in this way is one of the satisfactions of this collection: for Hogg, poems – like human life – are multi-faceted, and in constant flux. Majuba Road is a collection of poems that reach into their landscape but are not content to stay there: they are spirited forays into what it means to be one woman observing, living and sharing the challenges of the tough North Sea coastlands.